Online retailers lose an estimated £1.73bn in global sales each year due to slow loading speeds, according to new research from online customer data platform QuBit. 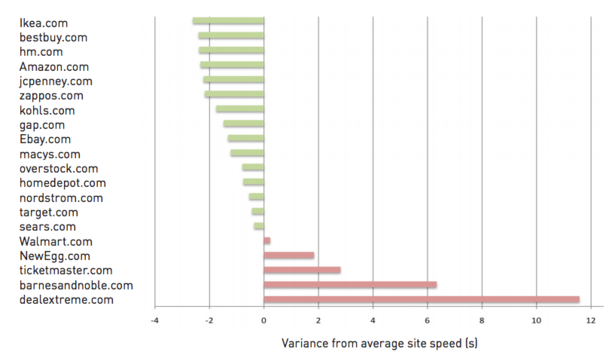 Slow loading times are incredibly frustrating for shoppers, yet the Retail Focus white paper suggests e-commerce sites do not see site speed as a top priority. The report also highlights the fact that consumers are becoming more impatient. In 2006 the average user would be happy to wait around four seconds for a page to load, but by 2009 this had halved to two seconds. Econsultancy’s Internet Statistics Compendium includes data from Rackspace which shows that 38% of UK online shoppers abandon websites or apps that take more than 10 seconds to load. Furthermore, Google considers a page to be ‘slow’ if it takes longer than 1.5 seconds to load and will consequently relegate it in the search rankings. As only a quarter (28%) of users bother to go past the first page of Google’s search results this could have a drastic impact on site traffic. Lack of speed also kills conversions on mobile: 74% of users will abandon after waiting five seconds for a mobile site to load. To quantify the actual impact of slow loading times, QuBit surveyed 60,000 consumers using its Exit Feedback tool where users are asked to comment on their experience at the point of leaving a website. Customer opinions were captured across 80 websites, within a range industries including retail, travel, technology, finance and publishing. Of those surveyed, 8% cited slow loading pages as a key reason for abandoning their purchase. QuBit, which is run by four ex-Googlers, said it is unrealistic to assume all of these users would have completed their purchase. Therefore it weighted the average conversion rate of web shoppers (4.35%) against the value of global online sales (£496bn). Based on this estimate, internet retailers could be losing out on £1.73bn each year. The report also evaluated loading times for pages across a range of industries. It found that on average homepages took 3.50 seconds to load, although some were as slow as 15 seconds. Product pages were the slowest, taking twice as long to load as homepages across the board. Use a content delivery network: this is a network of servers that delivers static content to users from the closest point of presence. It can increase loading speed for all visitors and is relatively inexpensive. Optimise image content: while high-res images look attractive, their size and prominence can slow down web pages. To optimise images you should remove unnecessary metadata, define image dimensions and use CSS sprites. Use browser caching: this can be used to remember static files from the site that have previously been downloaded. This means that should the user return to that site in the future, large elements can be immediately accessed from the cache rather than downloaded from the server. Minimise HTTP requests: QuBit’s Exit Feedback research also highlighted that one of the key issues faced by users was too much on-screen content, leading to confusion and eventually abandonment. In fact, some of the most effective uplifts in conversion can be delivered via streamlining web-pages, so minimising HTTP requests won’t only boost site-speed but in all likelihood will directly boost sales as well. Image credit: psd via Flickr.